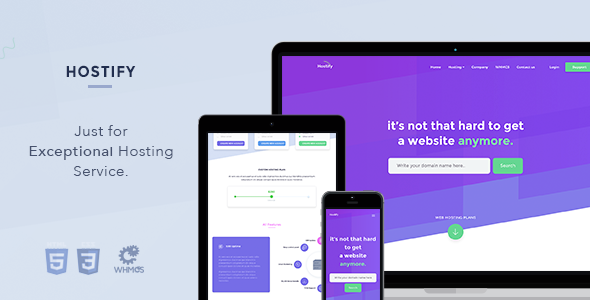 Just for Extraordinary Hosting Service — we have created Hostify as straight forward as possible. The revolutionary design and quality of code is something we never did before. Today, Hostify is stepping ahead with our Hosting Next generation themes. Join the revolution! – Oct 5, 2017 – ready for WHMCS 7.3, bug fixes, added two new pages “domains.html” and “ourservers.html”. – Aug 19, 2017 – bug fixes, added two colors variation, replace ”- head.tpl, header.tpl, footer.tpl, login.tpl, clientregister.tpl, style.css, style-blue.css, style-darkblue.css, styles-modified.css, styles-modified-blue.css, styles-modified-darkblue.css. – July 17, 2017 – bug fixes, updated files “style.css”, “style-modifiled.css”,”vpshosting.html”,”webhosting.html” and “cloudhosting.html”. – July 2, 2017 – Added mega menu, can be used in the WHMCS.